Climb the mountain, explore the caves, or check out the little islands off shore... Just load the parameter file (shellcity02.loo) into Sterling2 and this whole little world is yours. 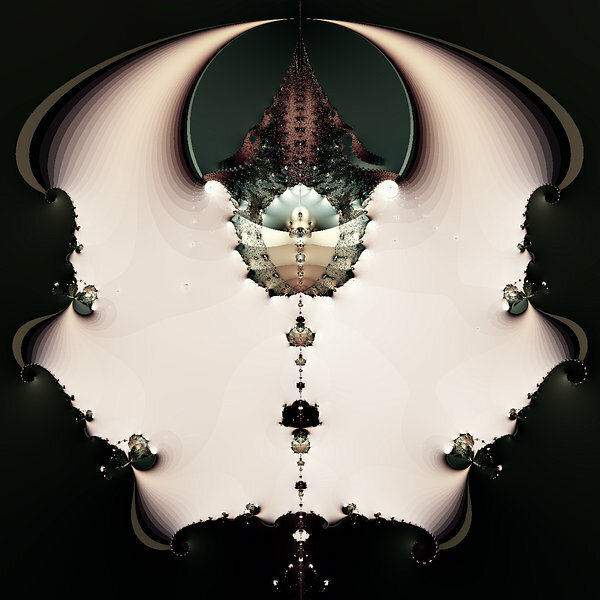 Fractals are a unique form of artistic imagery. They are more like sculptures and dioramas than the flat, static paintings they are often presented as because they can be viewed from more than one perspective. Fractal Art in it's simplest form is more like photography because the image is made up as much by what is left out as what is included. Fractal Art is an artform of editing and selection -- browsing and choosing -- from what the generator creates. In a simple, single-layer program like Sterlingware however, there's no reason why an artist has to limit himself to merely presenting still images to his audience. It's possible -- with fractals -- to present the viewer with the parameter file that will recreate the entire fractal environment and allow the viewer to explore it like it was a sculpture to be walked around and viewed from many angles. In this way, fractals have the potential to be an interactive art form just like the Grand Canyon in the United States is interacted with by tourists. Despite the fact there are plenty of photographs and documentaries of the Grand Canyon, people aren't satisfied with all that and still want to see it for themselves and experience it in its natural, interactive setting. I'm a big fan of Sterlingware because it's a creative tool that I just seem to get better results with than other fractal programs. I've always included parameter files alongside the images I posted on my blog and website because the parameter files are the Grand Canyon itself, so to speak, while the image is just a single view of it. With a program like Sterlingware, you can share an entire world with your audience and not merely a snapshot of it. The program automatically saves a parameter file everytime you save an image; and they're small too -- a 300 byte simple text file. It's like the image is a door and the parameter file is the great big world behind the door. When given the parameter file, viewers can walk through the doorway and explore the whole world instead of just standing there and looking at the door. Maybe I've looked at fractal generation differently. The way I've always worked right from the start with making fractal art is to adjust parameters and watch the effect it has on the appearance of a formula, in general, and then go hunting around for something to take a snapshot of. A good parameter setting in Sterlingware sets the stage for an ongoing harvest of interesting images. The combination of formula, render setting and color settings and a few other things creates a gigantic tree which now needs nothing more to complete the creative process than to be climbed and picked. With multi-layered programs the process, I suspect, is fundamentally different and yields results which are also fundamentally different. The parameter file of a multi-layered fractal program (like Ultra Fractal, for instance) is like a photoshop file composed more of layers and transformational effects than "fractal stuff". The result is that one doesn't create a Grand Canyon, one creates a Grand Photo. Nothing wrong with that except that the process ends with just an image or two instead of starting with it and opening up a whole new realm for exploration. It's just a difference in the way the two types of fractal programs and creative processes work. Single-layer programs produce imagery; multi-layer programs produce images. The imagery from a single-layer program is dynamic and almost limitless because it can be explored, zoomed, browsed, etc..., this gives it the potential to be more than just a still image creator and to exist as an artform which can be viewed from many different zoom levels and explored in many different locations. There's a term for this sort of thing; generative art or interactive or something. This sort of art is more than just a picture to look at and as such, the viewer's experience can be more than just look-ing; it can also be zoom-ing, search-ing, discover-ing. I'm not saying something crazy, such as a program like Ultra Fractal doesn't produce fractal art; I'm just saying that the way it works is much more complex and input-oriented and because of this it lacks a feature that the simpler, single-layer programs have, which is the interactive, flowing, real-time, mission-to-Mars capability that makes a program like Sterlingware so much fun to use and so much fun to share. When I first started using Sterlingware I saved thousands of images because using it was like going on a journey or expedition. I took snapshots of everything I saw because it was all so freaky and awesome. Later on I calmed down and learned to just capture the things that were really exceptional. But now I'm thinking that the journey and the expedition are unique aspects to the fractal artform and ought to be something presented to the audience as a form of fractal art in its own right. I like the notion of exploring based on a parameter set - I've done the same thing starting with some of Jim Muth's. However I think you're inventing a difference between UF and other programs. Layers aren't such a big deal. It's a common practice on the UF mailing list to 'tweak' parameters posted by other users - zoom in a bit more, change the coloring, etc. For that matter, look up 'photoshop tennis'. Another Scammy Contest, Or Just A Little Fun?